We Know Ourselves As Our Own Gods is set in the wild woods of puritanical fever dream imaginings of the Sabbath and is a precursor to the witch trials. 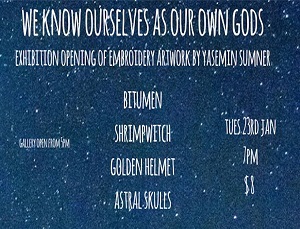 This is the third solo exhibition by Yasemin Sumner and is the sister project of her Punishment of A Witch series. All works are original hand embroidered pieces and will be available to buy. Tune in to State of the Art Wednesday April 24 when Yumi Umiumare chats about the upcoming performances for ButohOUT! Festival.